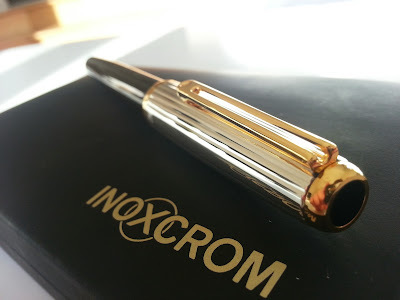 Little people might know this, but Inoxcrom was actually a serious pen manufacturer back in the days, I guess a lot of people don't even know this brand anymore, as they are now a much smaller, advertisement-pen brand. But, stating the obvious here, this pen definitely dates back from the age where they did still manufacture high-quality pens. 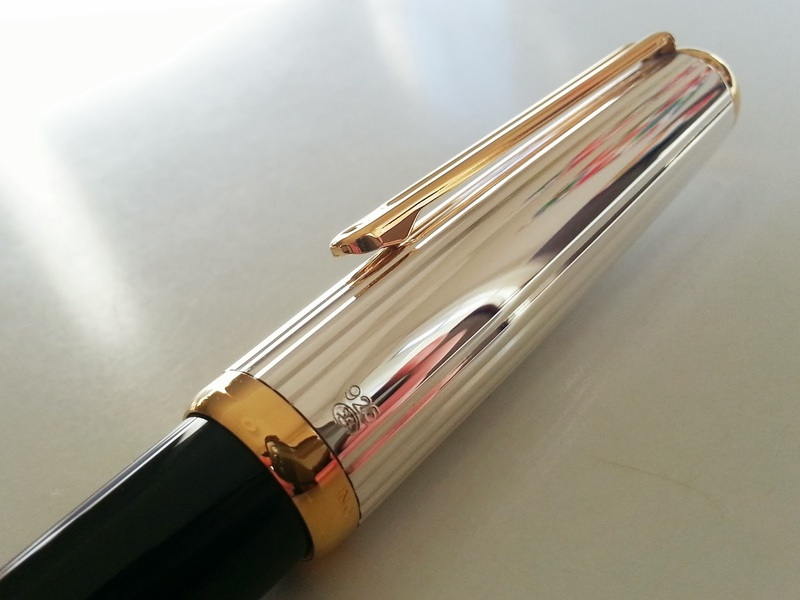 It comes packaged in a huge rubberized box with a very classy lined interiour in which the pen is presented. Nothing extremely special, but it's a pretty nice box. 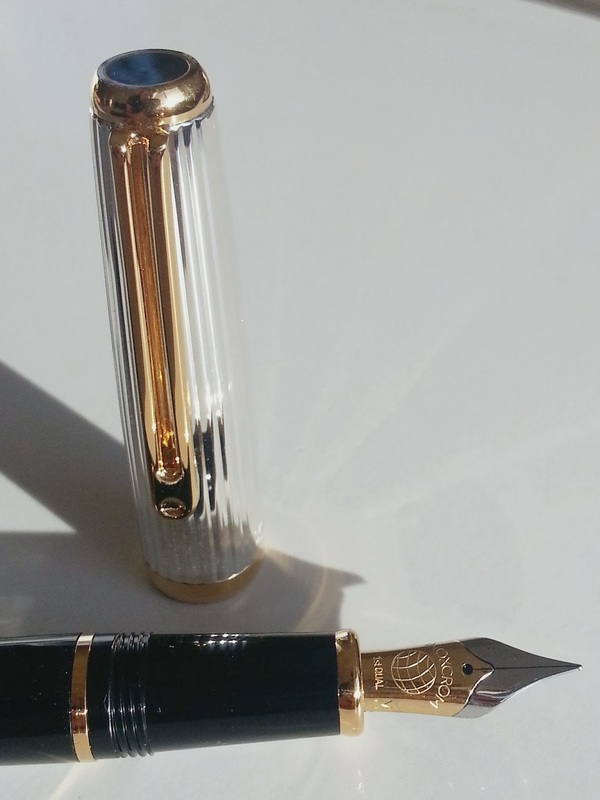 I don't really care about the box though, what I do care about is the pen inside it: a beautiful resin pen with a sterling silver cap and gold plated accents. 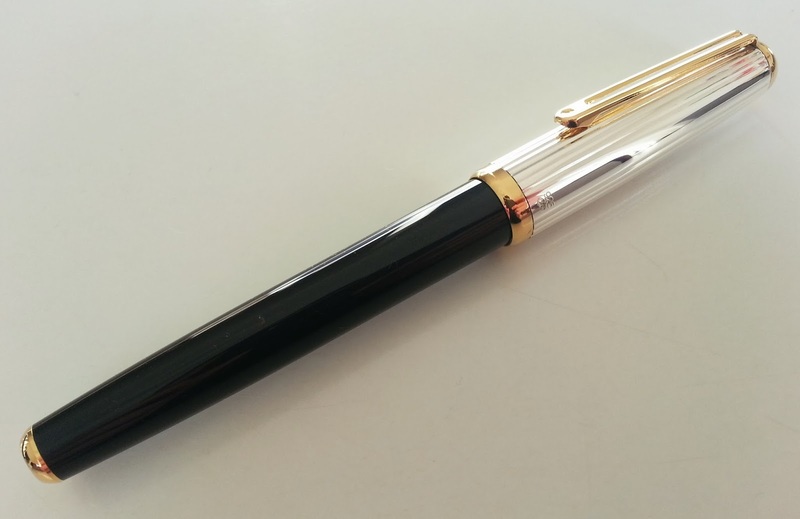 I absolutely love the way this pen looks, it's very classy, and it looks a bit vintage. 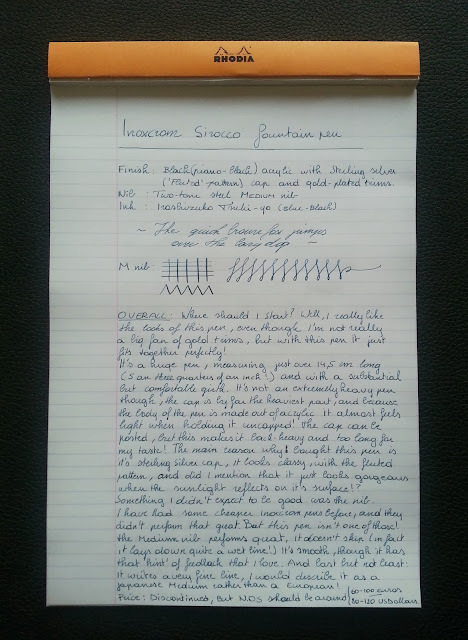 The Scirocco is a nice , big, solid pen. 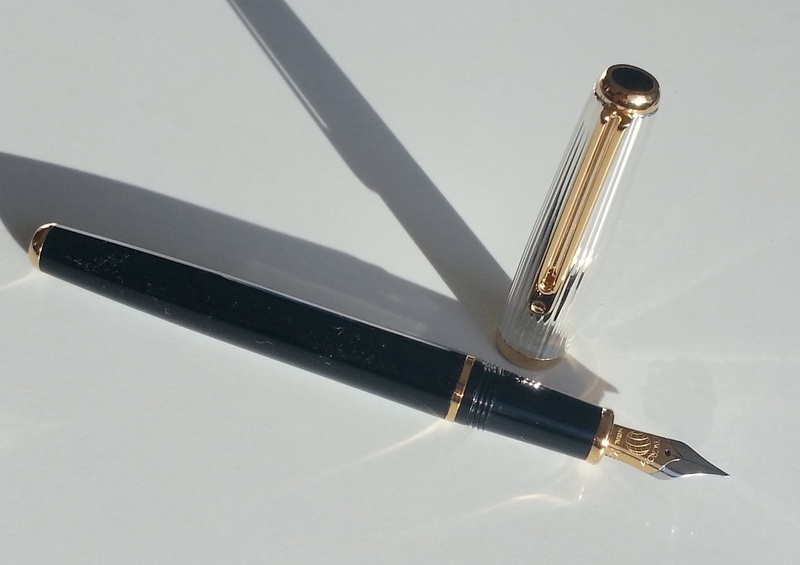 The sterling silver cap adds quite a bit of weight, though when writing unposted, the solid resin barrel and section are fairly lightweight considering the decent size of this pen. Posting the cap would obviously make this a back-heavy pen, so I rather prefer to use it unposted, but it is still more than decently sized to hold comfortably. The Scirocco has a nice Medium, two-tone steel nib (#6 size). The looks of the nib aren't my favourite, but it works great, so that does compensate something! It has a decent flow, though it's definitely on the dryer side. It writes very smooth, though with just a hint of feedback. And it produces a rather surprisingly fine line, something you'd expect on a Japanese Medium nib! That's all I have to say about it really! The Scirocco is a great looking fountain pen for an even better price. Though I can't tell how much the actual street value for this thing is nowadays! I suggest scavenging the internet for a while, ebay has some for sale I think, so it can't be that hard to get your hands on one of these! how much did you pay for this pen ? and where can i buy it ? Very nice pen. 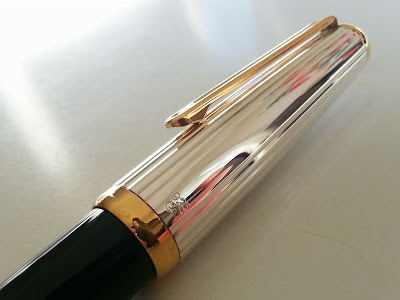 I just have buyed the whole silver version, with 14k nib. Very good pen, I love this pen made in Spain. Thank you for your very interesting post. I hace exactly the same one. My students Jade me this present 27 years ago ! I love the pen but most of all the nib after such a long time it’s perfect as you can imagine. Unfortunately the Corp is damaged. Do you know if I can buy a new one and replace the nib by my old one ? Thank you for reading! I have mine for sale actually, so send me an email if you're interested. I haven't used it much at all, so except for some silver tarnish (can be polished out) it's in pretty great shape.